Get the most use out of your living room, family room or home entertainment room with the help of this sofa group. This sofa offers comfortable seating as well as the ability to convert the sofa into a bed. With the included ottomans, you can easily add a sleeping solution to your living room when guests come over. The ottomans also allow for different configurations and can be paired with the sofa to form a sectional or together to form one long ottoman. You can arrange this comfortable sofa group in a configuration that suits your space and needs. Sleek track arms, tapered legs and tufted seats create a stylish, contemporary design in your home. 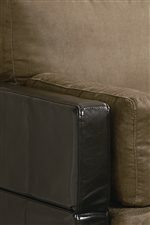 Two upholstery options are available, a soft, tan microfiber and faux leather two-tone or a full, two-tone faux leather. This modern sofa group will offer endless arrangements, plenty of space for family and friends, and comfortable seating in your home for years to come. The Ellesmere Contemporary Sofa Bed Group with 2 Ottomans by Coaster at Michael's Furniture Warehouse in the San Fernando & Los Angeles area. Product availability may vary. Contact us for the most current availability on this product. Fabric Content Two tone fabric features tan microfiber and brown vinyl base. 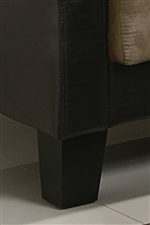 Leg or Skirt Block tapered feet. The Ellesmere collection features a contemporary sofa group that will help you get the most out of your living space with its versatility and multiple configurations. Featuring a sofa that converts to a bed and two ottomans, you can arrange this seating group to fit your space. This comfortable sofa group brings plenty of seating space for family and friends to gather in your living room or family room, and provides a convenient sleeping solution for guests to stay the night. The Ellesmere collection is a great option if you are looking for Contemporary furniture in the San Fernando & Los Angeles area.